EDINBURG — On the heels of a 41-point loss to CSU Bakersfield that dropped the UTRGV women’s basketball team to 1-8 in the WAC, coach Larry Tidwell delivered a message to his players on Wednesday. Facing a Seattle U team that entered Thursday ranked second in the WAC, UTRGV pulled through with a 69-67 win in overtime at the UTRGV Fieldhouse. Behind 22 points from Megan Johnson and 21 points with 11 rebounds from Quynne Huggins, UTRGV improved to 12-13 overall and 2-8 in the WAC, dropping Seattle to 13-12 and 7-3 in conference games. Huggins said the Vaqueros managed to maintain a positive outlook throughout a difficult first half of the WAC season. UTRGV Krisynthia Sampson on a drive to the basket against Seattle U Jacinta Beckley during the first half of a play at the UTRGV Fieldhouse Thursday Feb.15, 2018, in Edinburg. UTRGV Megan Johnson on a drive to the basket against Seattle U Kamira Sanders during the first half of a play at the UTRGV Fieldhouse Thursday Feb.15, 2018, in Edinburg. Staying optimistic was a challenge even on Thursday, as UTRGV faced substantial deficits three times. After going behind 9-0 in the opening minutes, the Vaqueros used an 8-0 run to move within 9-8. UTRGV fell behind by as many as 11 points during the second and third quarters but pulled into a tie at 47 late in the third period. Seattle surged ahead again, taking a 58-50 advantage with 8:00 to play before UTRGV used a 10-0 spurt to take its first lead of the night, 60-58, with 4:57 remaining. 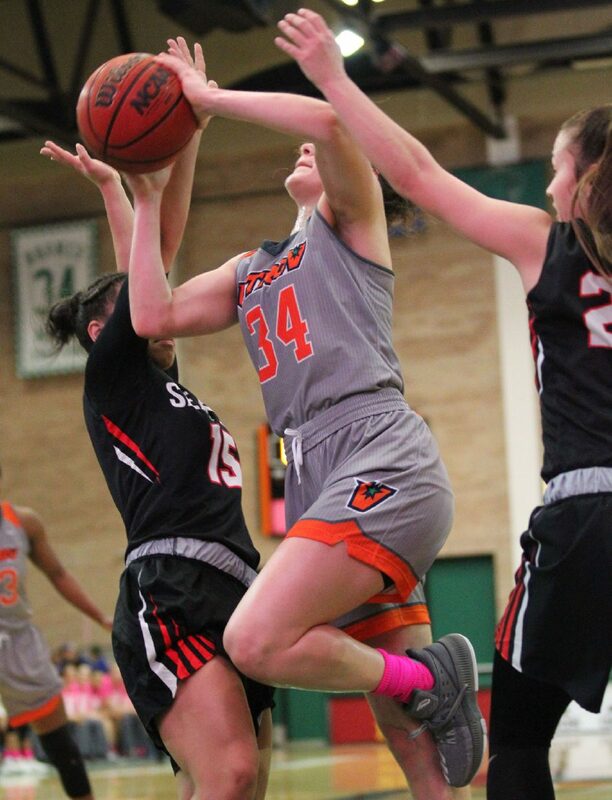 UTRGV led by as many as five points when Johnson converted a 3-point play with 2:34 to play, but Seattle scored the last five points of regulation to force overtime. Kamira Sanders hit a layup with 2:19 to play, added a free throw with 1:36 remaining and scored a layup on Seattle’s last offensive possession before overtime, with 24 seconds on the clock. Overtime was mostly a defensive struggle, with neither team scoring during the final three minutes. Megan Johnson’s jumper with 3:01 to play gave UTRGV the 69-67 lead that would become final. Seattle U’s last chance to tie or reclaim the lead ended when Madeline Dopplick missed a 3-pointer. McKenzi Williams grabbed the offensive rebound but could not attempt another shot before the buzzer. Seattle U played the overtime period without Alexis Montgomery, who entered the game as the team’s leader in scoring and rebounding at 20.3 points and 10.1 boards per game. Montgomery scored 11 points with nine rebounds, six assists and two blocks on Thursday before fouling out with 3:31 to play in regulation. 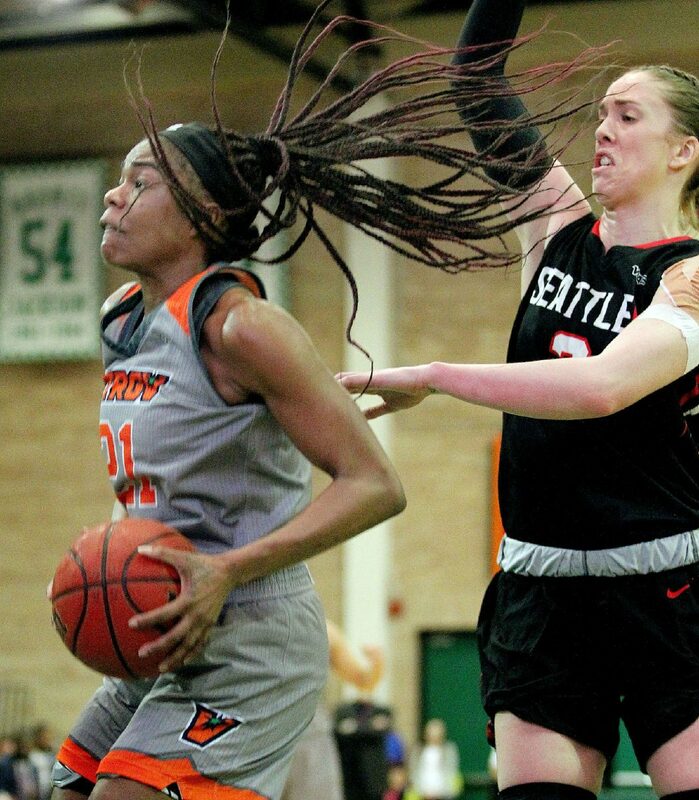 Jameka Dowell, UTRGV’s primary on-ball defender throughout the season, was tasked with guarding Montgomery but played just four minutes in the first half, leaving after suffering what was initially feared to be a concussion. She returned after halftime and finished with 21 minutes. UTRGV played just eight players on Thursday, and Tidwell said seven Vaqueros missed the game due to injury. Most notably absent were regular rotation players Idil Turk (concussion), Nichele Hyman (leg) and Laura Van Tilburg (knee). Van Tilburg entered the night leading the team with 5.8 rebounds per game and ranking second with 9.0 points per game. Still, UTRGV pulled out a win that players and coaches hope can be a spark going forward. The Vaqueros have five games remaining before the WAC Tournament begins March 7.